We have an electric motor to propel out boat along, in addition to the conventional diesel engine found on most canal boats. The electric motor is powered by batteries which are charged when we run the diesel engine (and discharged when we use the electric motor). So why do we have the electric motor? When we run on the electric motor there’s none of the vibration which gently rattles everything on the boat when we run the diesel and it’s almost silent. We can hear people talking to us from the towpath and hear the birds singing as we pass. As soon as we put the electric throttle to “neutral” there’s absolutely no noise. 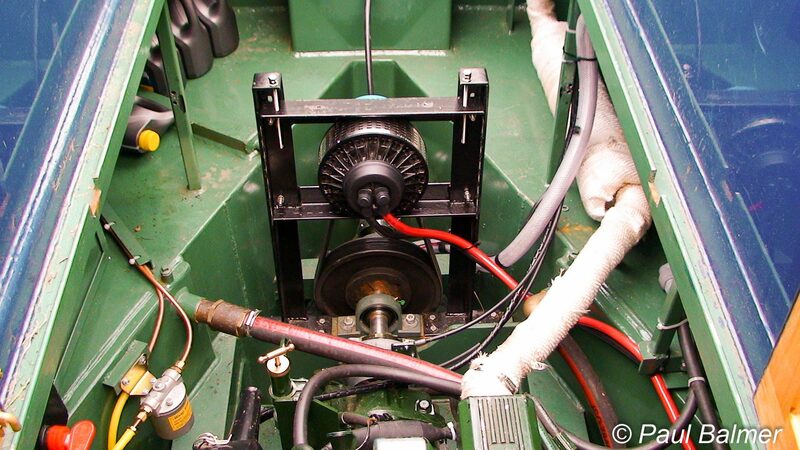 The conventional diesel installation uses a Beta Marine 43 with an alternator to provide 240v power. The only modification is the addition of a pulley on the drive shaft between the diesel engine and the stern gland (where the shaft goes outside the boat to the propeller) and the associated bearing blocks. 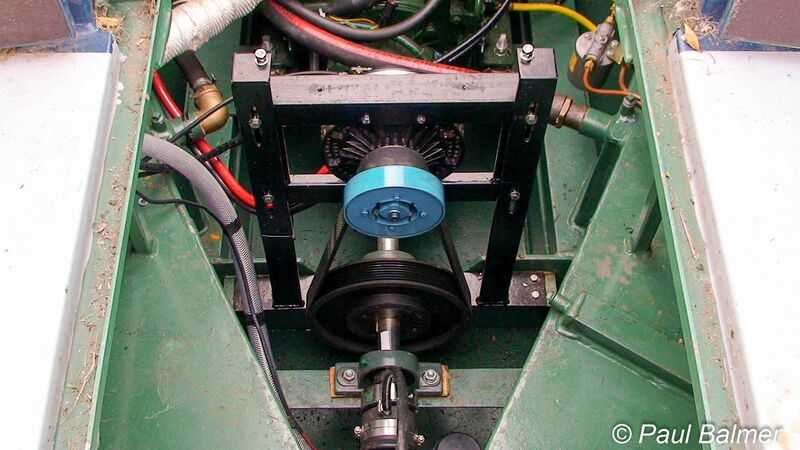 The electric motor is mounted above this pulley and drives the propeller shaft through a belt. On electric power, the centrifugal clutch on the electric motor engages and the electric motor turns the propeller through the shaft, with the diesel engine gearbox in neutral. On diesel power the diesel engine turns the propeller and the belt, with the centrifugal clutch on the electric motor disengaged. A simple interlock prevents both systems being used together – we keep the ignition keys for each system on the same key ring so you have to take one key out to use the other. We can change from one to the other in a few seconds – on the move if we want to. 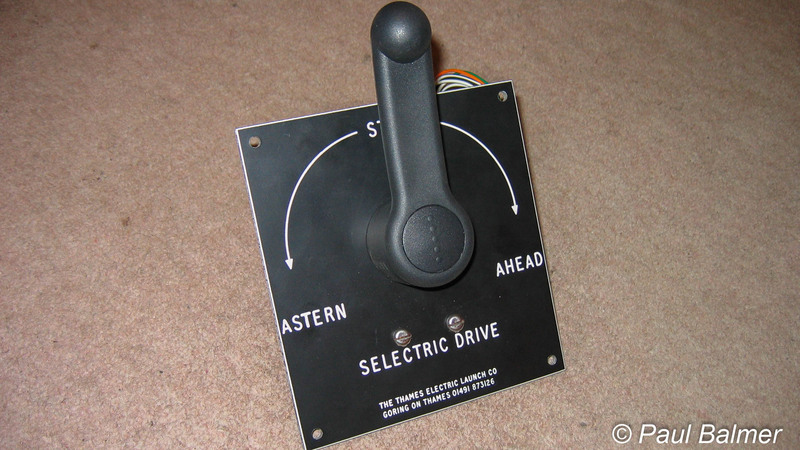 We used the Selectric system from the Thames Electric Launch Company. We’ll try to keep the figures simple, but it may get a little technical. The battery has a capacity of 720 units (720 Ampere Hours at 48 volts). To maximise battery life it is best to avoid discharging the battery below 50% too often, so we’ll talk about an available capacity of 360 units. 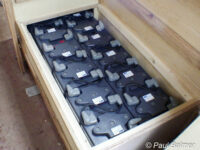 The batteries are in 4 banks, each with 8 x 6 volt cells, each a little smaller than a car battery. We could have less banks, with correspondingly less capacity. We can’t have more because we have reached the weight limit and the boat would sit too low in the water if we had any more. There is no added ballast in the stern half of the boat – the batteries are the ballast. The motor draws current at up to 100 Amps continuously (with up to 200 Amps available for short periods to give extra power while manoeuvring). 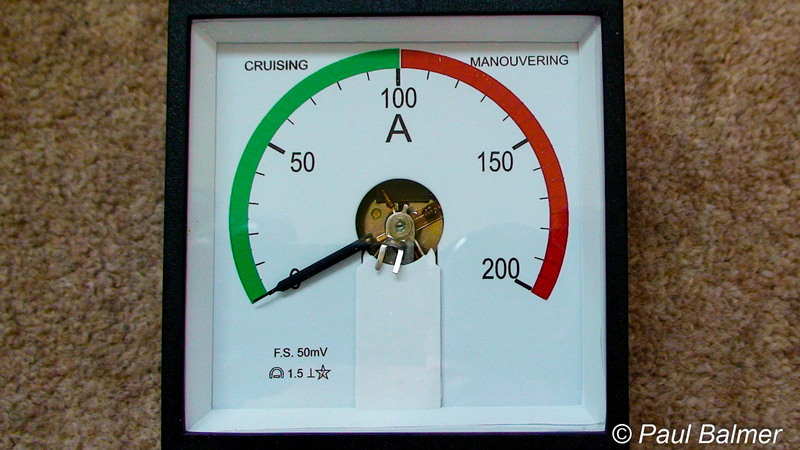 If we cruise at the maximum 100 Amps for 1 hour that would use 100 Units. If we cruise at 50 Amps for ½ hour this would use 25 Units. The same batteries also supply the domestic 240v supplies throughout the boat. For us, the average domestic load to supply computers, radios, television, microwave etc. is about 3 units per hour or 72 units for a whole day. We make no effort to be economical with the domestic usage and we could probably reduce it by at least 1/3 without much trouble. If it was just domestic usage we could supply the 240v power for 5 days without charging (5 days at 72 Units = 360 Units). So what do we get for the current propelling the boat? Lets look at three real cruising scenarios (taken from real measurements on the three journeys concerned). Our target during these tests was to travel at 3 mph whenever practicable (checked with a GPS unit), slowing as necessary for passing boats, entering locks etc. 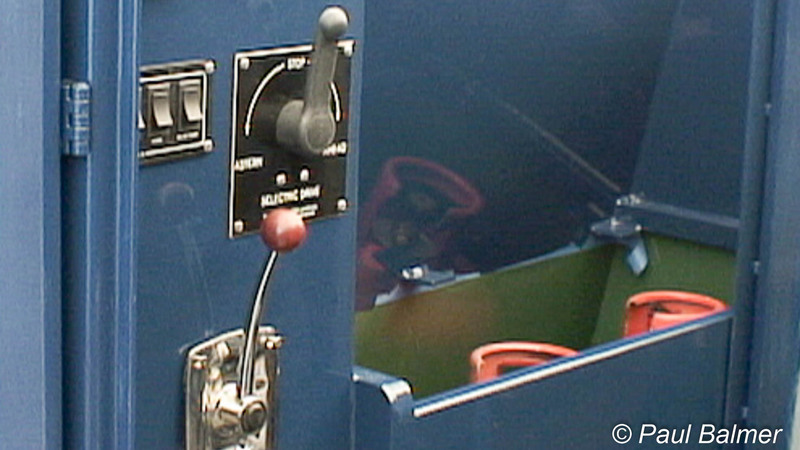 The boat was controlled during locking with the electric motor, rather than ropes. 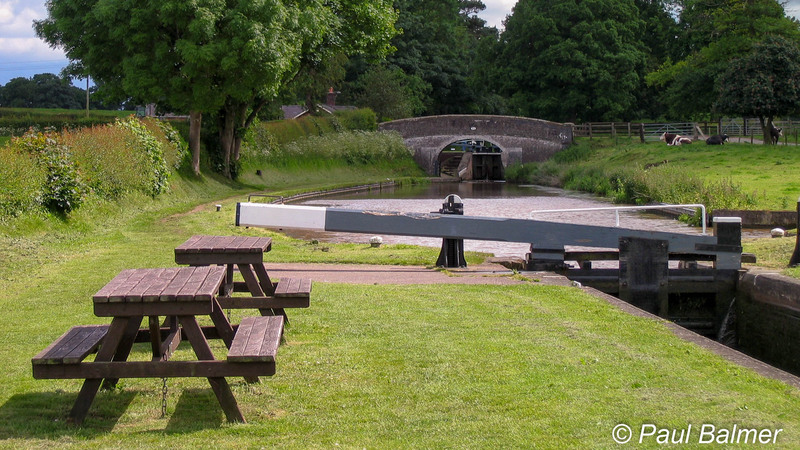 On the Trent and Mersey, descending Heartbreak Hill from lock 41 to lock 66 (both inclusive). A total of 8.3 miles and 26 locks over 9 hours. We used 213 Units. On the Shropshire Union ascending the Audlem and Adderley flights (including cruising between them). A total of 3.3 miles and 20 locks over 5 hours. We used 87 Units. On the Shropshire Union, cruising from Chester to Ellesmere Port (a broad canal with few moored boats so an almost continuous 3 mph). A total of 8.3 miles with no locks over 2 hours 50 minutes. We used 238 Units. Charging the battery happens automatically whenever we run the diesel engine. With the engine idling about 30 amps is put into the battery (30 Units per hour) and at full cruising speed about 54 Amps is put into the battery (54 Units per hour). As the battery charges and reaches around 80% charge the current going into the battery is gradually reduced by the charger so it takes a long time to fully top up the battery. At idling speed it would take around 16 hours to charge the battery and at full cruising speed it might take around over 10 hours. In practice the engine speed is frequently varied and the real answer will be somewhere between these figures depending on just what we are doing. Consider how often each motor/engine is turning. The diesel engine is turning all the time it is switched on, while the electric motor is only turning when you apply power to turn the propeller. As a rule of thumb, for every hour the electric motor is turning the diesel needs to be running for 2 hours to recharge to batteries. For our typical usage the electric motor is only turning for half the time we are on electric power so this means for every hour we cruise on electric we need to cruise an hour on diesel. We can cruise almost silently and free from the vibration and rattles of a diesel engine. We can film for our DVDs without vibration and diesel engine noise. We can stand a tripod on the rear deck and still get useable footage. There is a cost for the system – although some of this expenditure would still be needed to provide 240v supplies on the boat even if we didn’t have an electric motor. The motor takes up some of the limited space in the engine compartment making access to everything else a little more difficult. The batteries take up space inside the boat. As this is mostly under the lower bunks it’s not space which is easy to access anyway. The diesel engine also heats the hot water – so if we cruise on electric motor only there’s no hot water from the diesel engine. We usually make sure we cruise on diesel for at least an hour a day (often towards the end of the day) so we have plenty of hot water. Alternatively we can also heat our hot water from an electric immersion heater (20 Units per hour for 1½ hours = 30 Units, gives a full tank of hot water) or from the diesel powered central heating (with the radiators turned off in summer). The diesel engine also charges the batteries for the electric bow thruster and these won’t be recharged until we run the diesel for a while. We can’t cover everything in this short page, despite being a little technical on occasions. Alternatively you can contact the Thames Electric Launch Company, supplier of the Selectric system (please mention Waterway Routes if you contact them. ).